Former world boxing champion Eamonn Magee was jailed on Tuesday for threatening to kill his ex-wife. He was sentenced to three months in prison for making menacing remarks and kicking Mary Magee's car as he left her west Belfast home. The 39-year-old, of Eskdale Gardens, was convicted of two counts of threats to kill and causing criminal damage. The court heard the incident happened at Mrs Mcgee's house last Christmas Eve. She claimed in evidence that the former WBU welterweight title holder was drunk and aggressive when he appeared in the kitchen of her home on the Upper Springfield Road as she prepared the next day's meal. 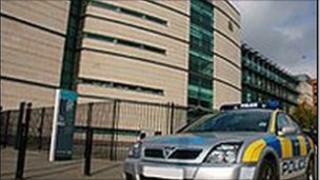 She told Belfast Magistrates Court: "I asked him what he was doing in the house. It was just a lot of slander, mumble jumble he was shouting back at me. "He was going on why would I not let him have Christmas dinner in the family house with the kids." She said Magee warned her he would kill her if she phoned the police before taking her purse and leaving the house, knocking over decorations as he went. Outside the property he kicked her Peugeot car, denting the door, the court heard. Magee, known as The Terminator during a career which included 33 fights, returned the purse untouched on Christmas Day and was eventually allowed back in when he agreed to behave, his ex-wife said. Defence counsel Declan Quinn disputed her account, however, and claimed she had made up false allegations about his client in the past. The court heard the couple have been involved in a long-running cash dispute involving more than £40,000. Mr Quinn put it to her: "What you were doing was financially bleeding him dry. That was your aim." The barrister also contended that Mrs Magee had been "in cahoots" with another woman with whom her husband allegedly had an affair. "Part of your reason for coming to court is revenge for his alleged infidelity," he claimed. She again denied this had in any way motivated her complaints. Giving evidence Magee claimed he had been back staying with his ex-wife both before and after the incident. "Me and Mary have been together the guts of 19 years, but at no time have I threatened to kill her," he said. But convicting him on both counts, District Judge Harry McKibbin said the taking of the purse clearly demonstrated there had been a falling out between the pair. He said: "Taking all these factors into account it is quite clear to me beyond all reasonable doubt that the injured party's version is absolutely true." The judge imposed a three month sentence for the criminal damage, and two months for the threat to kill, to run concurrently. He agreed to fix bail pending an anticipated appeal to the outcome. But Magee was kept in custody overnight until another issue separate from the case could be resolved.